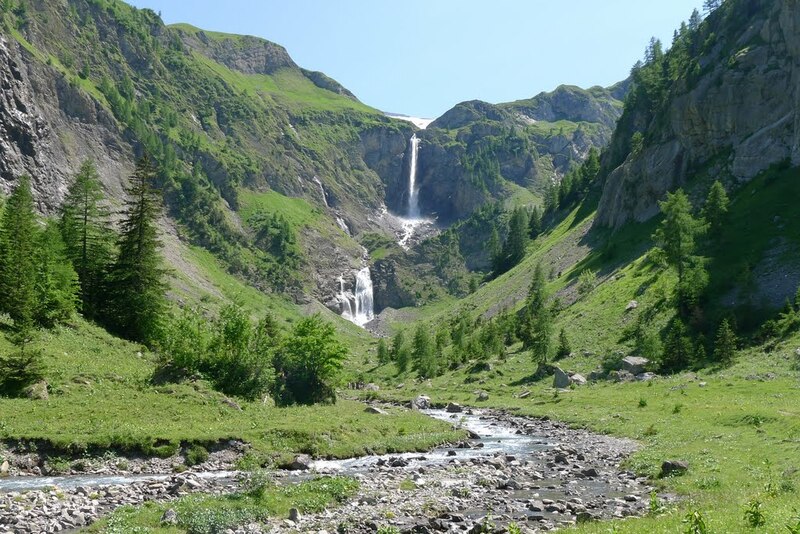 The trip started badly when one of the cases never arrived in Geneva – meaning no boots, ice-axe or crampons for two of our group. Easyjet tip – if they ask if you have any sharp objects do not volunteer you have an ice-axe and crampons in a case that’s going into the hold! This small inadvertant admission by David meant their baggage had to be checked in elsewhere and in the end never made the flight. Another Easyjet tip is…….fly BA from Heathrow as I did – less risk and you don’t need to worry about Easyjet’s 15kg baggage limit! This buggered up our original plan of driving straight towards Lenk and Iffigenalp, then immediately hitting the trail to head up to the Wildstrubelhutte at 2791m. As there was no other Easyjet flight into Geneva for 12 hours we decided to drive to a berghaus at Iffigenalp and then David and Gerry would drive back to Geneva in the evening to pick up the errant bag. A big thanks to Gerry who drove the 3hr journey three times that day and also got a puncture 1/2 mile from the berghaus when returning after midnight! After being woken up by the cows and their clanging bells at 4.30am we breakfasted and sorted our gear. The biggest challenge was how much food to take for lunches – a selection of tortilla wraps (long-lasting and don’t squash), kompt cheese and salami, together with a multitude of cereal bars, should see us through. The revised plan was to head straight for Cabin des Audannes – it was going to be a longer day than planned as originally we would have already gained the height the afternoon before. Hitting the trail at a leisurely 9am and heading south we were immediately into a steep 500m climb up past the deserted Blattihutte before the incline eased a bit but still climbed a further 500m to the Rawilpass. Here, looking east, we could see the Wildstrubelhutte, our original destination the day before – though the consensus was that it would have been a hell of a slog to reach it the previous afternoon and we would definitely have missed dinner! The terrain eased and we sauntered along a plateau surrounded by peaks still holding some, but surprisingly little, snow. After dropping down a little there was more ascent to Col de Eaux Froides at 2648m before a steep descent down loose scree to the Cabin des Audanne, perched just above the icy blue Lac des Audannes. It was a tough 7 and half hours to the cabin but the cloud saved us from the worst of the sun. We were the only guests booked into the hut that evening but with no showers a quick freshen up and a cool beer was the best we hope for before a welcome hearty dinner. After dinner we has a quick game of Scrabble to while away another hour – I’m not allowed to mention my first hand netted me 160 points, using all seven letters and including triple word score!! The official figures for the day are 1400m ascent and 700m descent, though with all the little ups and downs the log in my Suunto Core watch showed over 2000m of ascent and 1000m of descent for the day. No wonder we were a little tired! 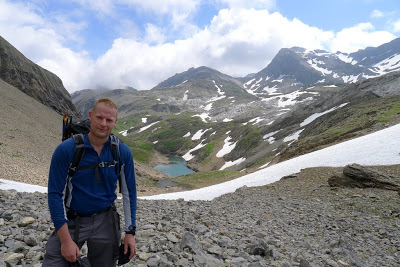 We headed up our planned route to the Col des Audannes, which at 2886m was to be the highest point on the route, and stopped for a break and to drink in the breadth and splendour and of the Alps spread before us. 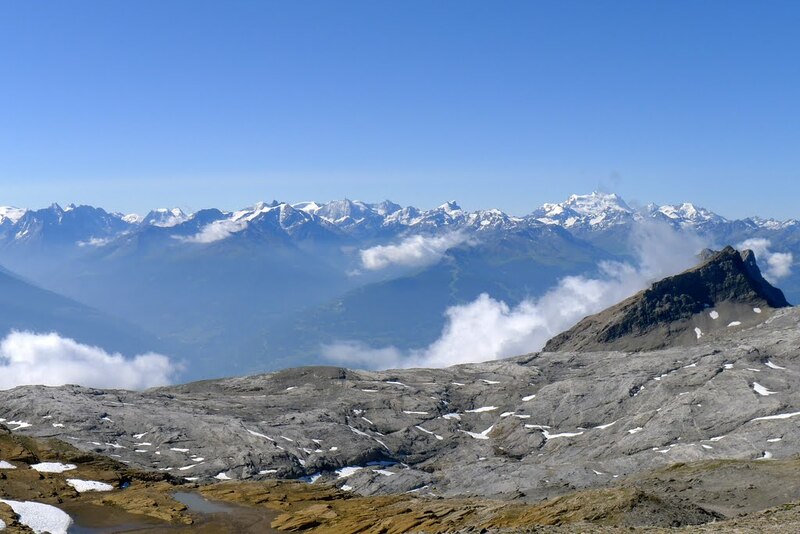 We tried to pick out the peaks from the obvious Mont Blanc to the east to the Eiger to our west and watched as the thermals from the valleys send clouds spiralling upwards. From here we could now see the route up towards the Wildhorn that the guide had sensibly warned us against – true to form it looked less than inviting without roped protection. 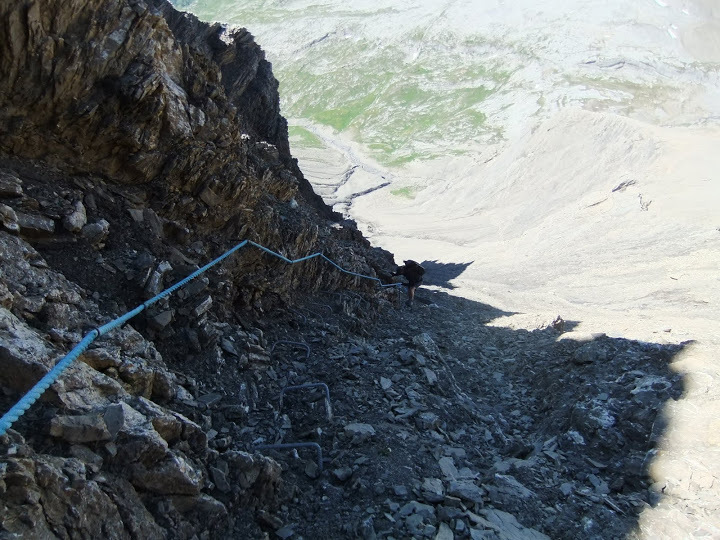 Our descent from the col was steep and loose and involved a 70m descent on ladders before traversing across a huge scree slope and more descent using a selection of fixed ropes, while watching out the odd rock falling from above as the sun’s rays bore down on the rock and ice. The heat was taking its toll as we headed down into the Grand Gouilles before ascending again to join the Arete de l’Arpille just south of the summit of Arpelistock. 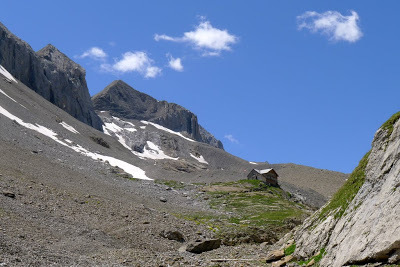 The arete dropped steadily and increasingly steeply (and narrowly) down to the Col du Sannetsch some 600m below and back into relative civilisation (well there was a road and a bus-stop!). Our abode for the evening was to be the Auberge de Sannetch, our abode for the evening and a couple of kilometres further north. A seven hour day with plenty of descent was tough on the feet and legs and a hot shower was welcomed almost as much as the cool beer. The owner of the auberge was an interesting character – a bearded, bespectacled, head-scarf wearing Harley-Davidson motorcyclist. We had great food (sirloin steak lump stewed for 20 hours at 75 degrees), local wine and entertainment (a kind of ‘Master of the Marmot on which was surreally bizarre) and live sorbet making involving lots of liquid nitrogen, alcohol, vigorous stirring and plenty of smoke! 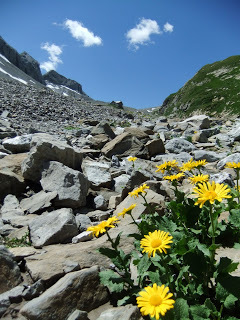 The next leg of the tour was to see us dropping down from the mountains and into the green and verden alpine pastures. Beautiful to look at I do prefer the stark beauty of rock and the mountains. I was looking forward to this leg the least – it appearing more of a country bimble than a mountain route. We immeditaley descended north, the path clinging to the side of the head of the valley. We stopped after hearing a rumble and shouting to see a number of boulders tumbling down and forcing another ascending group below us to scatter. 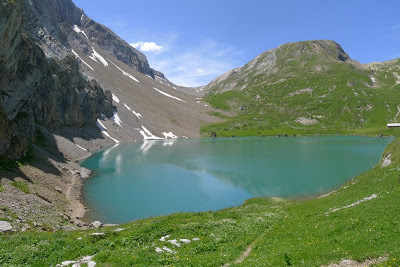 The temperature was around 30 degrees as we dropped down to 1400m, ascended back up to 1900m, before dropping again down to Lauwensee at 1380m before a long climb up to the Geltenhutte at 2000m. Geltenhutte is a lovely spot and 4 Euros for a shower was a bargain after a sweltering day. An earlier start as we had to get down to Iffigenalp, get a new tyre and get to Geneva airport. 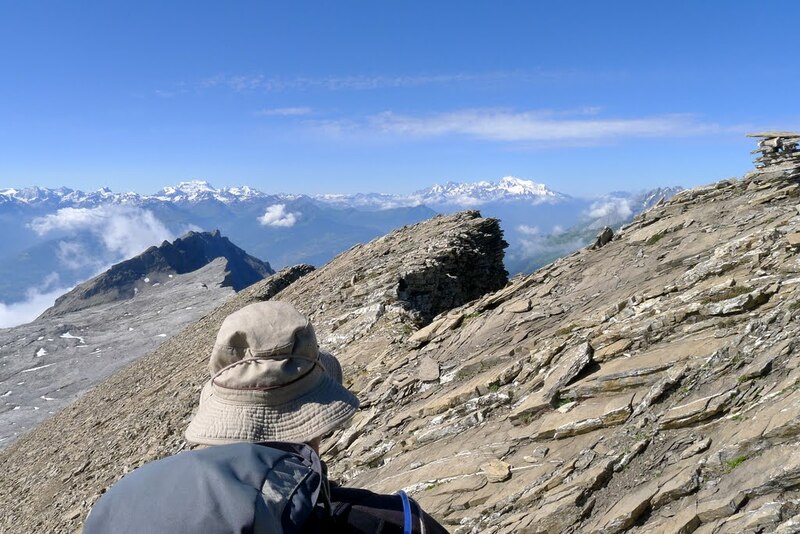 Nevertheless we we still last to breakfast at 7am with the other guests having a proper alpine start as they were heading up the glacier to either Gelthorn, Arpilstock or Wildhorn summits. 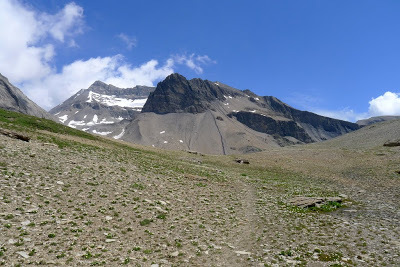 We headed along the other side of the valley from our ascent the day, before gradually heading down into the pastures before more ascent to 2381m where we could see Iffigee lake way below us. Our route was to traverse and ascend the valley head up to the Wildhornhutte at 2303m where a somewhat premature celebratory beer and lunch was consumed. It was all downhill from here, descending past the lake, we wound our way back down to our start point at Iffigenalp. Thanks to David for the planning, Gerry for the logistics and driving and Simon for the entertainment. And apologies for the lack of umlauts – no idea how to type them on my keyboard!! More pics from the trip on my Picasa account here. Video here. ← Previous Previous post: A Quick Post….at last! Next → Next post: Shiny New Gear! !